If you’re traveling across the U.S. and around the world, chances are you’ll come across an Applebee’s. They have 2,000 locations across the globe, including Canada, the Caribbean, Middle East, & the Netherlands. The ubiquitous chain offers a variety of foods from burgers to pasta to tacos to seafood. 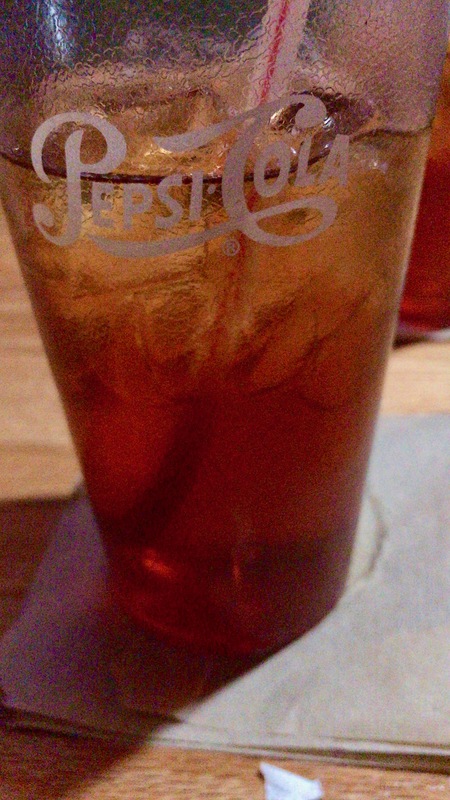 Fun fact: Applebee’s original name was Applebee’s Rx for Edibles & Elixirs. What a name right? The Applebee’s concept was sold in 1983 and the name was changed to Applebee’s Neighborhood Bar & Grill three years later. For a more in depth history lesson, check out the “Our History” page. We nearly went to Applebee’s on Veteran’s Day, but they were swamped; there were no parking spaces open. Our dad called tonight & asked us if we wanted to go to dinner. 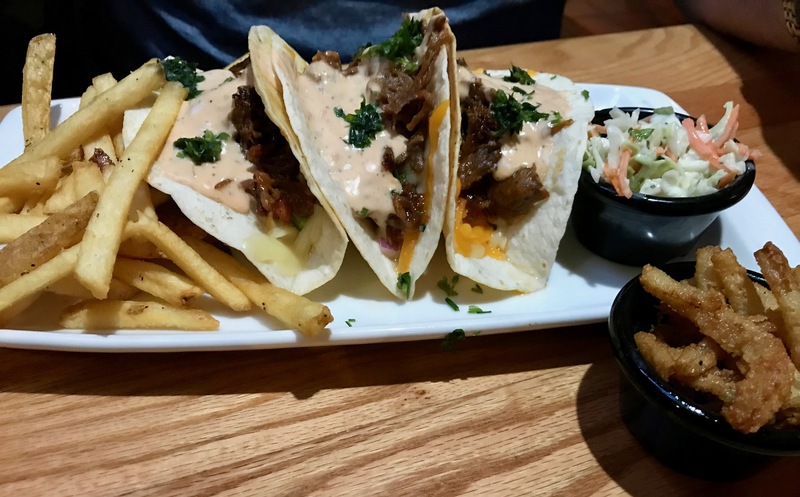 Turns out I needed a new restaurant to review, so we decided to try our luck going Applebee’s. We had a later dinner, so we were lucky to miss the rush. Although Nikki looked over the allergen menu online, she asked for one at the restaurant. FYI: If you view the Allergen or Nutrition menus on a laptop/desktop, it automatically downloads it. On the mobile site, it opens a PDF file. Our server brought Nikki a binder with each page in a sheet protector. The menu is broken down in categories such as Appetizers, Soups & Salads, Steaks, etc. There are columns for each sensitivity (such as soy). It was easy to read. Our waiter even made a suggestion of what was popular for gluten-free patrons (Nikki would’ve had to take too much off in order to fit her needs). Since each location is different, she asked several questions. One question was what the food was cooked in; he checked with the cook he wasn’t sure what all was in the oil. On the menu, the grilled chicken was marked as safe for Nikki to have. The fries were also marked safe for her to eat, so she got a double order (it was also the only side she could have other than a plain salad). She often has to miss out eating fries and takes advantage when she can. For those of you with food sensitivities/allergies, you are about to see foods that may not be suitable for you to consume. Please scroll down…now. Our dad ordered the BBQ Brisket Tacos with fries. He really enjoyed them. After debating between a few items, I decided to try Chef Bulgarelli’s Stuffed Rigatoni and Tomato Sauce. It’s a mouthful, but it’s worth it! I think they forgot that the breadstick was in the oven. Caine ate half of it. I would like to mention that their tea was DELICIOUS. We Southerners take our tea very seriously. We all really enjoyed our food. It had been several years since any of us had been to Applebee’s. Our service was really great too. Nikki didn’t study the menu really hard, but she’s not sure that she can have any other food. The steaks weren’t marked safe for her to eat (possibly due to seasoning). Unfortunately, they do not offer gluten-free buns. It’s always great to have another dining option for her. If you liked this review, you might also like Chili’s, Texas Roadhouse, Ruby Tuesday, IHOP, and Golden Corral. As always, sharing is caring. Never miss a blog update by subscribing to my mailing list. Be sure to follow GFS on social media using the buttons below. Applebees is so good at making sure the customer gets what they need. We had a local Applebees that was incredible for making it like I needed it. They were really great and patient with my sister’s questions. It make the experience even better! Eating out can be hard with dietary restrictions! Great info for when we go to Applebees! I’m glad to hear you found this info helpful! I’m so glad to hear that, Romy! 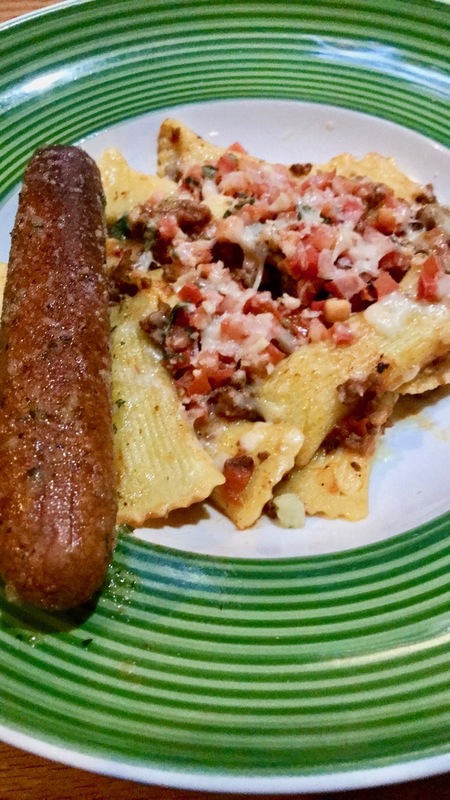 I love Applebee and their food to offer. This was a perfect place that will provide provide food according to your diet. It’s great to have more places to go and the food is good. I love when restaurants give you the option to see their menu online before hand so you can decide if there is something there which is suitable to you. So glad you enjoyed your food. I am sure a lot of people will find this very helpful! I’m glad you enjoyed your experience at Applebees! As someone with dietary restrictions, I often eat at known restaurants when I travel. Asking about specific food prep is so important! The original name sounds funny. Oooh i would love to order the hotdog and egg. That looks so yummy. I thought so too & had to share it! 🙂 That does sound good! My daughter had to eat gluten free for quite awhile. We traveled a lot during that time. 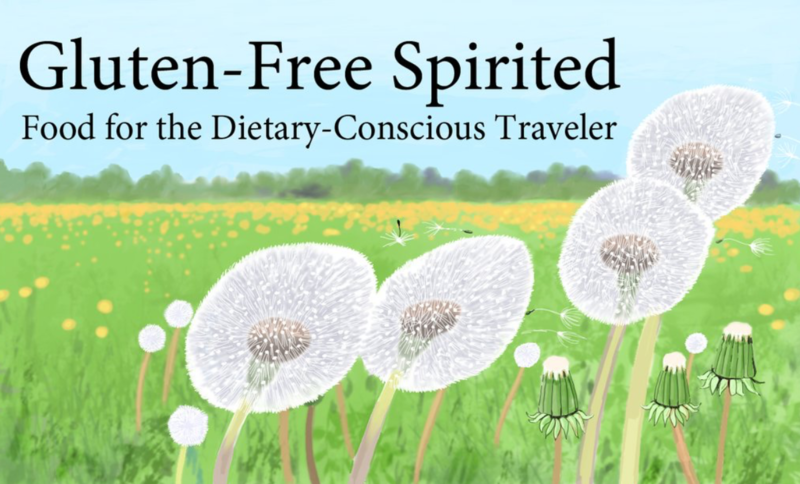 It was always a challenge to find true gluten free food. I was always thankful for places like Applebee’s that were so careful and took food sensitivities seriously. I agree, Vanessa! It’s hard enough as it is, so we’re thankful for restaurants with options and that care. 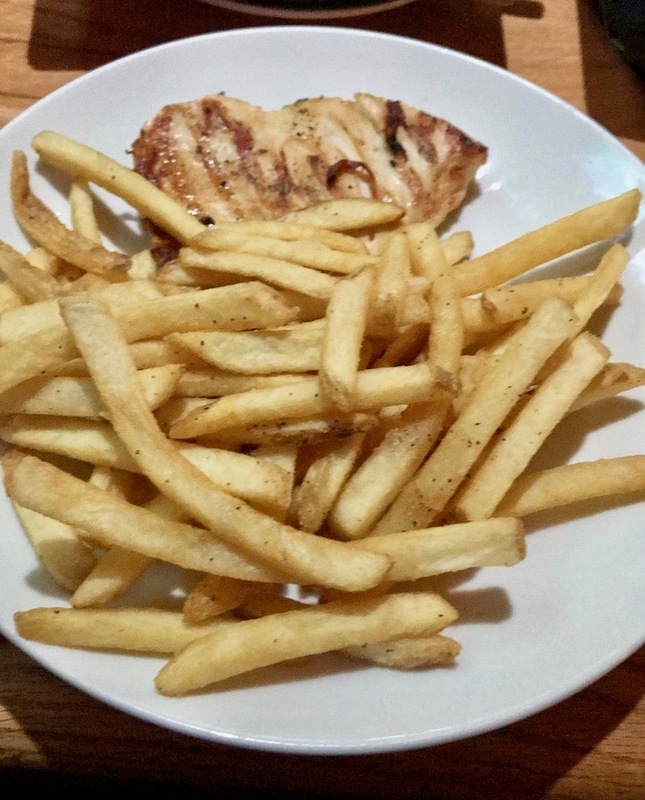 Applebee’s is one of my faves for sure! Great tips! So that’s Applebee’s! I’ve heard the brand name so many times in movies. I think we’ve got quite a romantic view of it over in the U.K. It looks good ? Hahaha this is it! 🙂 We really enjoyed the food and had great service. Ordering out can definitely be challenging with dietary restrictions. I remember when my brother went GF for a summer. I’m glad more menus are offering options. I can’t imagine how hard it was to find options even 5 or 10 years ago. We really enjoyed their food and always glad to have a new option!